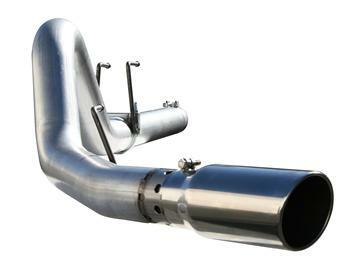 The aFe Large Bore HD Exhaust System eliminates the use of the restrictive diesel particulate filter (DPF) for maximum performance and extreme mileage gains. This free flowing exhaust system is constructed out of durable 4” 409 stainless steel and uses bayonet style hangers and band clamps for a clean installation. This system comes complete with all tubing, muffler, bayonet hangers, band clamps, thermocouple and pressure tap bungs.